of the Secret Space Program in 2018.
in a higher mental coherence state. to a newly emerging ‘High State’. Some of us are well on the way. programmed by the Deep State. shaping our perceptions in 2019.
readers who share what I’ve missed. is the ‘Big Show’ in the Universe right now. As the producer/host of the Cosmic Show for almost 12 years, I’ve interviewed at lot of people including whistleblowers in the Secret Space Program and messengers of the Ascended Masters who are stepping through the veil to lay the foundation for a golden age. Full disclosure, in my case, should reveal that I’m a ‘UFO contactee’ (explained on my January 5th Cosmic Show) going back to the early 70’s. And I’ve had numerous ‘miracles’ in my life that I can only attribute to Ascended Master intervention. In my compendium called ‘Meetings with Miraculous People’, read the story about ‘Wayne’ – a real ‘sorcerer’ who had been going to source since he was 3 years old, trained by ‘grandfather’, the shaman on the Pine Ridge Indian reservation where Wayne lived in his formative years. Wayne knew all about the ET’s. Wayne had gone to source on this subject over decades. He could access the Akashic records on anything, could see the auras around people, had three holistic healing centers, and was a practical visionary who made millions on dozens of inventions ranging from an upgrade of Wilhelm Reich’s orgone energy accumulator to advanced Royal Raymond Rife technology – a modified square-wave chip in a Texas Instruments signal generator – for healing disease with frequencies that ruptured the membranes of fungal, bacterial and viral pathogens. Wayne fine-tuned Tesla’s technology for an energy shield that kept the snow off his house, and he used 12 Tesla coils to charge water with 3 octaves of a frequency that ‘inactivates’ microbial parasites when you drink it over a month or two. The full range of ‘bugs' - from fungus to cancer virus - died off. I worked in his laboratory. We shipped truck loads of this water all over the U.S. I ran his office in 2001, loading trucks with a forklift and scheduling shipments. But I digress. Wayne had a UFO viewer. 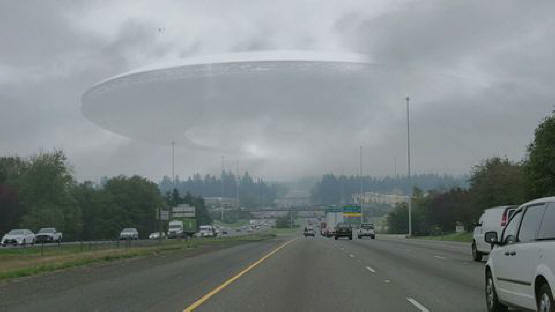 It was a high-power infra-red viewer that revealed the sky full of cloaked UFO’s. They’re all around the planet – millions of them from across the universe – watching the big drama as Earthlings wake up, wise up and rise up to eventually welcome our ‘Space Family’ on Earth as in Cosmos-at-large. This is hard to believe – that our progress is being closely monitored. Non-interference with our free will is the operant policy of the Prime Directive, but there are exceptions to the rule; nuclear war has been banned so we can evolve without destroying ourselves. Keep that in mind. Universe has rules. Full disclosure of the ET connection to Earth’s true history and future is busting out of the matrix mindset programmed by Deep State consortiums which want no awareness or oversight by the public at large. This is ‘Big Drama’ shaping 2019. Watch the following video by Jordan Sather to see how mainstream media is now beginning overt disclosure of the Secret Space programs I’ve been reporting over this last year. Worldwide exposure of the Secret Space Programs on the Internet is forcing disclosure of the truth in the lamestream media before they lose all credibility and viewers and advertising $'s to independent news sources on the Internet. That’s another megatrend shaping 2019. The High State of public awakening is wising up to the Deep State’s psychology of subservience to tyranny since 9-11 – their terror tactics for shock and awe that rolls over to power without Constitutional principle. That crisis is coming to a head in 2019. Social media has liberated social conscience in social networks worldwide to the point where the Deep State is now scrambling to survive the High State of a new ‘Common Sense’ arising. Big Tech has been co-opted by Deep State agendas to commandeer Internet media – with censorship and demonitization – to shape public perception. Their time is short, their desparation is obvious, and their cultural war against the truth is blatant. Technocracy (new 'must read' article by Jon Rappoport) has hijacked Net neutrality with mass manipulation of the 'mass mind' in social networks. It’s now rather self-evident that Big Tech has gone the way of Big Oil, Big Banks, Big Media and the Big War corporatocracy cabal… making a mockery of ‘Do no evil’ with a control-to-profit agenda that literally makes a killing on population reduction policies. is the ordained power of love. When you REALLY know better you can do better. Deciphering the disinformation in any media can be difficult, but it sure beats the stupid alternative that gets along by going along with high sounding talking heads on TV who are subservient puppets of the Deep State. Planetary society is in a healing crisis folks. There is warring in the members of civilization like an auto-immune disease in the body of humanity. Fortunately, there is a systemic energy shift occurring with quantum field harmonics of a coherence nature that is matriculating the matrix of public perception with a new ‘Common Sense’. And United Sovereigns of Earth are committed to realizing the opportunity for global holistic healing very quickly. Most long-time readers of 2018 Global Upgrade know what I’m referring to. Initiates are sometimes self-identified as lightworkers who link the light of enlightened wisdom for empowering a higher standard of love-in-action. These Initiates are well aware that the higher the standard of – as universal law and language – the greater the results for universalizing TLC at the heart of global TeLeComm and TeLeCare – the ‘Alpha’ and ‘Omega’ of global holistic healing. Realize that wins in the end. I’m not saying it will be easy. Adversity brings out the best in true initiates on the path of Evolutionary Ascent. Many souls on Earth have incarnated from throughout the universe at this time to fulfill their soul-contracts for serving with their much needed gifts and talents. “You don't have a soul. You are a soul. Soul evolution and Earth changes will be accelerating in 2019. Geopolitical change is also forcing the issue of either cover-up or full disclosure of advanced technologies for free-energy, anti-gravity and healing with light and sound frequencies. The challenge is spiritual above all. The Deep State’s primary tactic is fear-based subservience if not outright terror through false flags and incessant negative news to depress the High State of fearless faith in the Power of Love that heals all. So Keep the Faith – Connect with Source! True initiates on the ascending path up the 'highest mountain’ (High State attainment) are well aware we are ALL ordained to be mediators if not messengers of ‘The Presence’ (Unity Conscience) – ‘The Field' of Common Sense – on Earth as in Heaven-Cosmos at large. The 2019 rEVOLUTION will see the process of global transformation accelerate with the first principle of quantum reality that fully comprehends how the TeLeComm we design for – or otherwise co-create – is the TLC we get. There’s nothing more powerful than a timely vision of virtue and valor for the victory of universal law and light language – a universal interface for global wholeness and healing that is the blessing and sealing of light servers and makers. committed to 'BEING' all that I Am. only to know the nature of love itself. Note: Earth’s divine destiny has already been fulfilled in ‘The Continuum’. The blueprint for a golden age is fore-ordained, and from a higher 5D perspective, it’s all in divine order. But the timeline (4D) for manifestation is not etched in stone. Mankind has free will so anything is possible… even 5D Co-Creation and beyond for the few who will hold the balance for the many. who calibrate at the lower weakening levels." it never happened. Nothing to see here?!? with gradual disclosure so we are ready? NYC '3rd eye' (metaphysically) of the U.S.? Realize what’s really going on folks. Personally, I identify strongly with U.S. Founding Father Thomas Paine who sparked the American Revolution as a citizen journalist who wrote a series of articles - compiled as COMMON SENSE - to lay out the ways and means to liberate Americans from the tyranny of foreign governments and their banksters backers. IT'S A GLOBAL ISSUE NOW. Time and space - as we have known it - has been eliminated by the instant-everywhere and interactive Internet. The Family of Mankind in a global village has arrived in principle, and the New American rEVOLUTION is rapidly going global in practice. Most people are not aware that the Secret Space Program has had a stargate program going beyond our galaxy for decades. David Wilcock and many other whistle-blowers have come forth with this REALITY which is called 'fake news' by lamestream media. Actually the Deep State has been hiding their stargate program right out in the open - subliminal disclosure - through a brilliant psy-fi TV series that ran for 10 years ('97 to 2007) called Stargate SG-1. You can watch the series for ‘free’ (trial membership) at Hulu.com. Stargate SG-1 has several episodes on disclosure of the Stargate Program and the problems, chaos, panic and political subterfuge (if not martial law) that disclosure could cause... and we are seeing parallel scenarios today as a massive distraction from what's REALLY going on. Keep in mind that wins in the end... and that we're winning from the beginning with a vision of virtue and valor for the victory of personal and planetary SOVEREIGNTY. All 'US' as United Sovereigns of Earth. Common Sense today would say that unity in global diversity is just as important now as it was when 'E Pluribus Unum' (Out of Many - One) was engraved on the Great Seal of the United States. The higher the concept of universal-cosmic at the interactive interface heart of mass-to-mass TeLeComm, the greater the results for systemic-holistic TLC for TeLeCommunity, TeLeConscience, TeLeCare and TeLeCommerce... socially, politically and economically. So fill your love tank now for 2019.
that is for giving - not for getting. feedback over this last year. from all of 'us' at UltraMedics.